If you have a child that is interested in football regardless of age, have them check out one of our free intro resources located in the right column. Our site has a tremendous amount of info so please read through the information on our website. Can't find what you are looking for? Just email us and we'll be happy to chat with you. Interested in becoming a sponsor of Glencoe Youth Football? Want to participate in your local community? 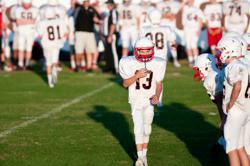 Become a sponsor for Glencoe Youth Football and support youth in your area. ©2019 Glencoe Youth Football / SportsEngine. All Rights Reserved.